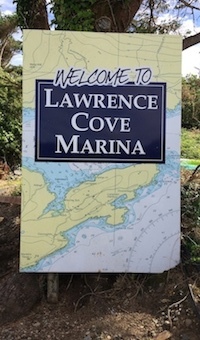 Whether you’re arriving from the Azores or from Cork; for a night’s stopover or longer stay, there will be a friendly welcome from Patrick and Rachel at Lawrence Cove Marina, Bere Island. Opposite the fishing port of Castletownberehaven at the North side of Bere Island you will find Lawrence Cove Marina, the only fully serviced marina between Kinsale and Cahirciveen. Nestled in Lawrence Cove Harbour near the village of Rerrin on Bereisland, one of the most sheltered harbours in Bantry Bay and suitable for short and long stays. Full facilities: Water, Electricity, and Diesel on the Pontoons. Showers, Toilets, & Laundrette ashore. At reception there is a Marina craft shop. 10 minute walk to village shop, Post Office, Deli and pub. Ferry to mainland and Buses to Cork provide easy access for Crew changes. Winter Hard Stands and Repair/Maintenance services available.